NASA's Deep Space Network has not heard a peep from Opportunity, a Mars rover, since the robot fell silent June 10, drained of power in a dust storm that has turned day into night on the red planet, preventing sunlight from reaching the rover's solar cells. Project Manager John Callas said Friday flight controllers are listening every day just in case Opportunity manages to beam a signal back to Earth. But given the dust storm's severity, it could be weeks before they learn if the hardy robot survived its trial by dust. "No change," Callas said in a telephone interview. "No word from Opportunity. We've been listening every day (but) the dust storm has actually gotten worse, it's become a planet-encircling dust event. The last indications were that there were no signs of its abating. Is it a week? Is it a month? No one knows at this point." The dust storm was first detected May 30 while Opportunity was pressing ahead with exploration of a channel-like depression in the rim of a large crater. At that point, the rover's batteries were delivering 645 watt hours of energy. But the skies quickly darkened and four days later, the batteries were down to 133 watt hours. Science operations were suspended on June 8. A final transmission came in two days later showing the available energy had dropped to just 22 watt hours, around the minimum level required to keep the robot awake. NASA's Curiosity rover, 5,200 miles away exploring the lower slopes of Mount Sharp in Gale Crater, has also reported sharply reduced visibility. 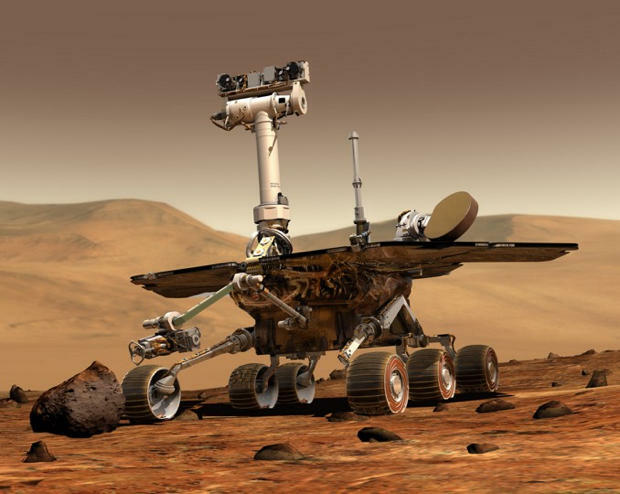 But unlike Opportunity, Curiosity is powered with electricity generated by the heat of decaying plutonium and the dust storm is not expected to have a major impact. Whenever the sky eventually clears, Opportunity's batteries should recharge, the central computer should reboot and, executing stored commands, the rover should attempt to phone home for instructions. But how long that might take is anyone's guess at this point. Callas said he's optimistic Opportunity will survive, pointing out it was originally designed for a 90-day mission and has now operated on the surface of Mars for more than 14 years. The rover's minimum operating temperature is minus 40 degrees Celsius, about four degrees lower than it's expected to experience during the dust storm. "It's the electronics that are the lifeblood of this vehicle," Callas said. "If the electronics are working, this thing should power up and talk to us. In order for it to talk to us, there are no actuators that have to move, nothing has to move on the rover. I'm not concerned about mechanical things. It's really all about the electronics." And Opportunity already has experience with the same sort of shutdown it's experiencing now. Due to problems with its flash memory, the rover already was shutting itself down every day and "sleeping" through the martian night. "What it's doing right now is no different from what it normally does, it's just doing it for an extended period of time," Callas said. But the conditions are the harshest the rover has faced since it landed on Mars in January 2004. "You cannot see the surface of Mars where the rover is located," Callas said. "You don't see any light in the sky. The sun may be as bright as the planet Jupiter is to us. You might be able to see a little pinprick in the sky, but it's dark. I doubt you'd be able to see the horizon." If the rover survives as he hopes it will, "I'm going to describe it as like, you know, (Ernest) Shackleton's adventure on the ice," Callas said. "They disappeared, no one thought they could have survive more than a year and sure enough, they all survived."